Here we are at the end of 2018, and here are the last additions to the library before we ring in the new year. 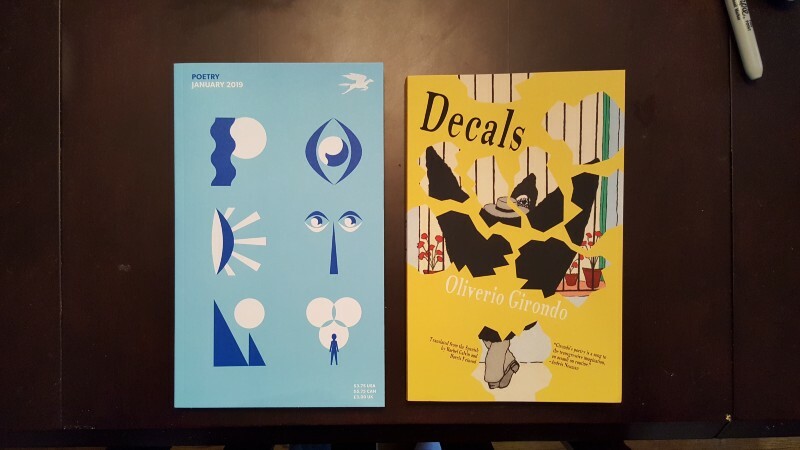 On the left is the January 2019 issue of Poetry, and on the right is Decals by Oliverio Girondo, the latest from my subscription to the catalog of Open Letter Books. The holidays have been hectic as always, but I have made good progress in Ada Palmer’s Too Like the Lightning. I hope to have it completed before ConFusion 2019, where Palmer will be the Guest of Honor. 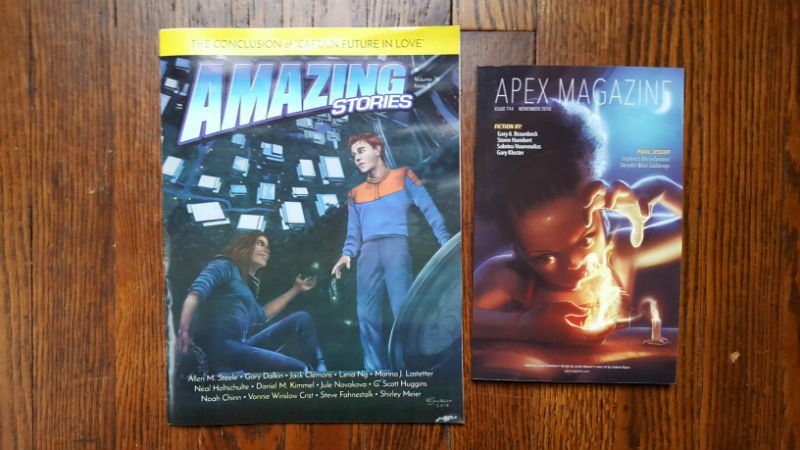 This week brought a wide variety of new reading material in a small stack. 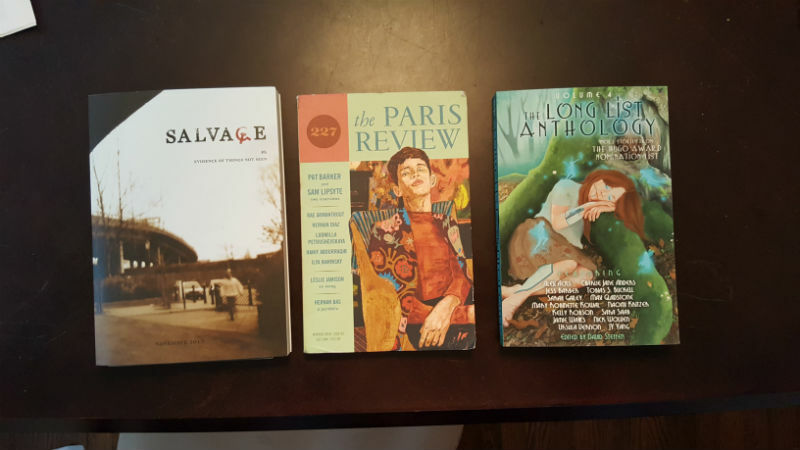 The latest issue of Salvage just arrived, along with the latest Paris Review and the fourth volume of the Long List Anthology. I’m off of work until January 2, so I should be able to sneak in some reading time. I finished reading Ferret Steinmetz’ excellent The Flux and am now dividing my time between Too Like the Lightning by Ada Palmer and Seth Dickinson’s The Monster Baru Cormorant. Earlier today I opened the Fall 2018 edition of the Copper Canyon Reader, which contains some excellent poetry by several Copper Canyon poets. 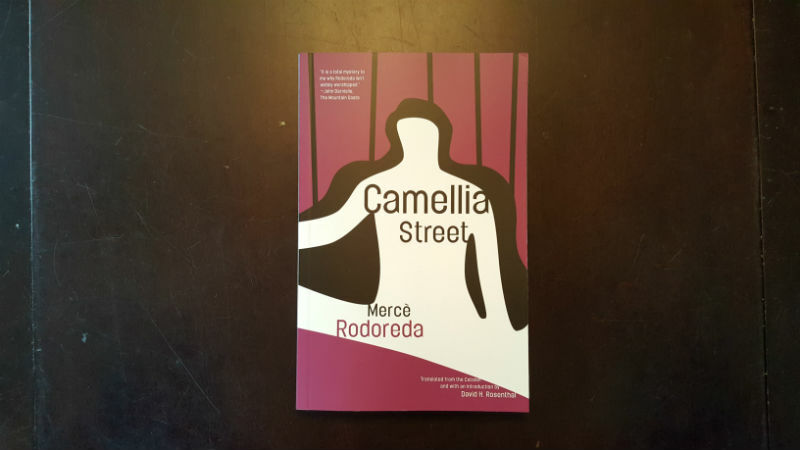 I would get a subscription to Copper Canyon, as I have to so many other wonderful publishers, but their subscriptions are $1,000, and that it a little steep for me at this point in my life. And since this is likely the last post for 2018, Merry Christmas, and Happy New Year! A long write-up in Harper’s on Oulipo, centered around All That Is Evident Is Suspect: Readings from the Oulipo, published by McSweeney’s. Which I own. The book, not McSweeney’s. An amazing collection of photos of science fiction fandom, from cons and parties throughout the 60s and 70s. And yes, because it is the end of the year, a list of literary figures we lost in 2018. Damn, but I’m still broken up about Anthony Bourdain. Because it is the holiday season, here is a rather well-done biographical film of H.P. Lovecraft. Some new books by Muslim authors we can look forward to in 2019. Me? I’m waiting for The Kingdom of Copper by S.A. Chakraborty, the sequel to her excellent The City of Brass. Yeah, not a lot to add from the past week. Everything is Christmas wishes, end-of-year lists, and the ineffectual flailing our 45th POTUS. I expect things will pick up again in the new year. A few new books with dark and somber covers to match late-autumn Michigan. 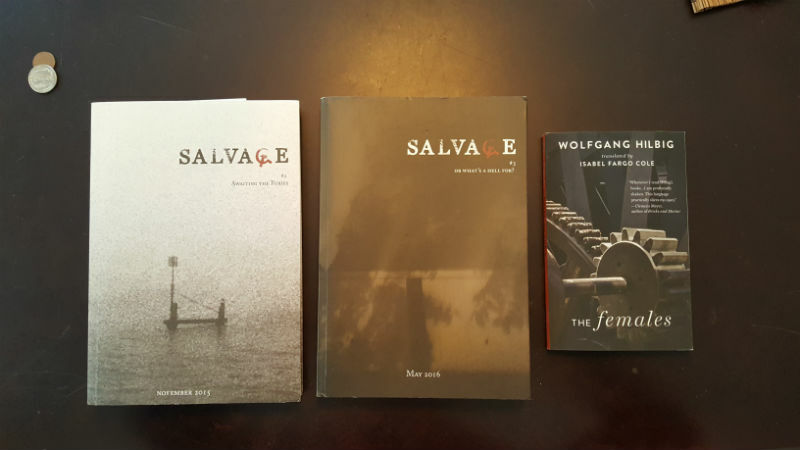 The first two are the second and third issues of Salvage, which bills itself as “a quarterly of revolutionary arts and letters,” and has the tagline “bleak is the new red.” It is good. Really really good. I first heard about it when researching different *punk literary subgenres, and came across an article about China Miéville wherein he discussed his involvement with Salvage. Miéville has lengthy essays in each of the issues I have so far purchased (2, 3, 5) and likely will have more in the future issues which arrive as part of my subscription. Well, of course I purchased a subscription. On the right is the latest shipment from Two Lines Press, which continues to surprise me with wonderful books. On the reading front, I have mostly recovered from the week at the AWS:Reinvent conference in Las Vegas, and am partway through The Monster Baru Cormorant by Seth Dickinson and Flex by Ferret Steinmetz. Both are quite excellent reads and they are absolutely nothing alike. I highly recommend both. Over at GQ, a beautiful, funny, heartfelt, tearjerker tribute to Anthony Bourdain, from some of the may people who have known, worked with, and loved him. A good list of the nonfiction which has appeared on Tor.com in 2018. Excellent interview with, and discussion of, China Mieville. And in odious political news, Metafilter has just posted the latest in their long-running series on the regime of Terribly Triggered Trump. And for a ray of hope in these troubling times, here is an interview with Chris Hedges where he discusses the current state of the USA, and his new book America: The Farewell Tour. November was crazy busy, what with National Novel Writing Month and the AWS:Reinvent conference, so here are all the links from November 4 until now. Regular posting will resume, er, whenever. Some beautiful artwork from Russia’s early wars. Tor.com’s list of new Fantasy, Science Fiction, and Genre-bending books coming out in December. NPR’s amazing, wonderful, awesome list of their favorite books from 2018. Well over 300 books to add to your list. Page also includes links to their annual lists going back to 2008. The Millions is currently posting their 2018 Year In Reading list, wherein the Millions contributors discuss the books they have read over the past year. Link goes to the archive page which also includes reading lists from past years. Kirk Thatcher, the punk from Star Trek IV, is an amazing human being.